Liverpool have received a stern warning over the eye-watering fee the club will have to fork out in order to sign goalkeeper Alisson. 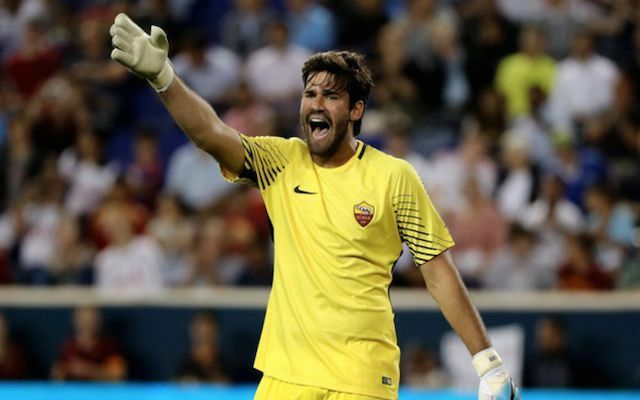 Roma’s first choice shot-stopper has surfaced as a potential summer target for the Reds as Jurgen Klopp seeks a long-term solution to his goalkeeping woes. The Brazilian’s standout second season in Serie A has seen his value rise significantly and propelled him into the elite bracket of keepers Liverpool are seemingly intent on turning to. Alisson’s swift impression in Italy has already earned him a promotion to the top of the goalkeeping pecking order for the Brazilian national team. The 25-year-old represents the type of assured and accomplished long-term option Liverpool have been tipped to spend big on when the transfer window re-opens. Klopp’s transfer business could first hinge on how Loris Karius finishes the season after he recently replaced Simon Mignolet as the Reds’ no.1. Both have failed to convince throughout the campaign, with the latter’s career on Merseyside seemingly drawing to a close. There will be few arguments against Klopp breaking the bank to address a weakness that has cost the team so often over the past few years.